Died at the PCU at the Miller Centre on February 1, 2019 Ruth Bowering age 83. Predeceased by her parents Isaac and Eleanor Bowering, sisters Ethel and Eleanor, brothers Lester, Heber and Nathan. Leaving to mourn her husband Gerald of 59 years, daughters Deborah and Susan and son Peter. Also five grandchildren Mark, Keith, Adam, Tyler and Morgan, two great grandchildren Jamie and Keira, one sister Jean and sister-in-law Alma. Visitation will be from 7-9 pm on Sunday, February 3, 2019 at Carnell’s Funeral Home. Funeral service will be held from the Carnell Memorial Chapel at 2 pm on Monday, February 4, 2019. To Gerald and family. So sorry to hear of Ruth’s passing. I know the pain of losing the love of your life. I think that the depth of your love is the depth of your grief and I know that you loved Ruth dearly. She was a beautiful person and I feel privileged to have spent some happy times with you and Ruth in our younger days. I was disappointed that I could not attend her funeral as I had an appointment that afternoon. 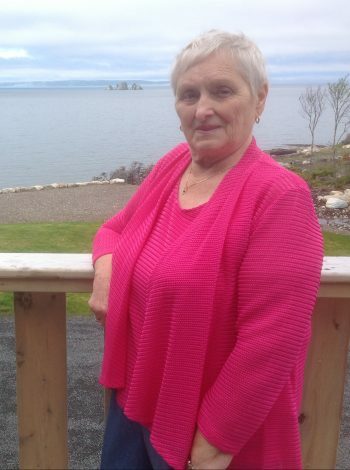 Gerry, Deb, Peter, Susan and families, so sorry to hear of Ruth’s passing. The news was recently brought to our attention by Bev & Glenn. They join us in passing on condolences. We have happy memories of time spent together. God Bless. So sorry to hear of Ruth’s passing. Sincere condolences. May your memories and comfort of family and friends bring you comfort at this time. Gerald & family, Sorry to hear of Ruth’s passing, our sincere condolences . I am so sorry for the loss of your mother. Thinking of you and sending hugs! My thoughts and prayers are with you and your family at this difficult time. Sending huge hugs. Sue, sorry for the loss of your mother. Condolences to you and your family during this time. To the Bowering family, so sorry to hear of Aunt Ruth’s passing. Sending condolences to your family at this difficult time. I was sorry to hear of your loss, mothers are so dear to us, may your memories console you in this difficult time. I hope you feel surrounded by love as you grieve the loss of your mother. Thinking of you and your family at this time. My heartfelt sympathy to you and to all those who are grieving the loss of someone so dear. My thoughts are with you at this sad time. A beautiful picture of your mother. Thoughts and prayers to you all as you celebrate her life. Sympathies to all who loved her. So sorry to hear of your Mom’s passing. My thoughts are with you and your family. To Gerald and Family, condolences to you for your loss. My sincere condolences to you and your family at this time of loss and sadness. You will be in my thoughts and prayers. Thinking of you all and wishing you strength and peace. So sorry for your loss Susan and family. My thoughts are with you today. To: Gerald, Peter, Debbie & Susan. Our condolences to you all at this time on your great loss. Sorry we are away but be assured you are in our thoughts every day at this time. We have spent many memorable happy times to-gether with your mom and dad, and you mom will be missed. We will be in touch with you, Gerald. Love to you all. Mr.Bowering, Deborah, and family-My thoughts are certainly with you this weekend and will continue to be in the days ahead. Extending sincere sympathy-Pat. So sorry to hear of Mrs Bowering’s passing. When we moved to Main Dam Rd we knew we had great neighbors. We still call it the “Bowering” house. Years have gone by since you moved but we always knew how you were doing. You are in our thoughts and prayers. My thoughts and prayers are with you at this sad time. May all of the beautiful memories you have of Ruth console you and bring you comfort. We enjoyed many fun times with you and Ruth as we bowled together on Wednesday mornings. I was so incredibly saddened to hear your news. The loss of a Mom is a sorrow all its own. And your Mom was truly a wonderful person who made me feel welcomed and cared for always. Sending wishes for peace and comfort as you move through the days and weeks ahead. With much love as always. To Gerald and family so sorry to hear of Ruth’s passing. Our thoughts are with you all at this time. Sorry we are not able to be with you at this time due to being out of the province. Deborah I am so sorry. Your Mom was a very nice lady and so loved by her family. My thoughts and prayers are with you and your family at this difficult time. Deepest condolences to you and all your family. Our deepest Condolence’s to you and your family. So very saddened to hear of Ruth”s passing. She was a wonderful person and a dear friend to my parents Hubert and Emma Harnett. Thinking of your family at this difficult time. Sorry to learn about Ruth’s passing. You are in my thoughts and prayers at this time. Very sorry to hear of Ruth’s passing. Had so much fun on Ruth and Gerry’s bowling team with the RTNL league. My condolences to Gerry at this time. Sorry to hear of Ruth’s passing. Cherish the many wonderful memories of the past. May the God of all peace, comfort you now during this very difficult time and in the days ahead. Although we are out of the province, our thoughts and prayers are with you at this time. We were saddened to hear of Aunt Ruth’s passing. We fondly remember your visits to Mom and Dad in Campbellton, they were certainly enjoyed . Cherish the wonderful memories of her. Our thoughts & prayers are with you all at this difficult time. Gerald and Family. So very sorry! We are out of province but please know that I am thinking of you at this time. Gerald, Debbie,Susan and Peter you are in my thoughts and prayers, I’ve known Ruth for a good part of my life she was a wonderful lady and I’m so sad she’s passed. Uncle Gerald, we are so very sorry to hear of Aunt Ruth’s passing. We have very fond memories of Aunt Ruth from when we were younger. She was always wonderful to us. Our thoughts and prayers are with you, Debbie, Susan and Peter during this difficult time. Uncle Gerald, Deb, Peter and Susan…you are in our thoughts. We were very sad to hear of Aunt Ruth passing. I have such fond memories of Aunt Ruth, her smile, laugh and sense of humour. I will always treasure our email messages with each other, sharing her special wedding anniversary with her in Nfld and the last time we were together in New Brunswick at Uncle Gerald birthday. Out prayers and thoughts are with you.